Inspired by Me & Boo’s precarious travel tale #2 I have a travel tale. Don’t know that it’s that precarious but it’s one I’ll never forget. I’d spent a few days in beautiful Prague despite a case of the flu. 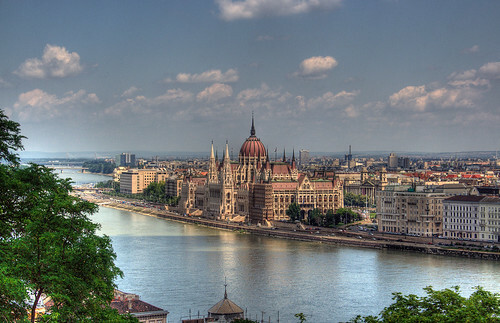 My next destination was Budapest and I hopped on the train, sat myself down in a seat feeling a bit revolting and my hair felt greasy even though I’d washed it recently. All the way to Bratislava (on the border of Hungary) people had been speaking non-English and I didn’t understand a word and I didn’t understand why they kept looking at me. In Bratislava two men stood outside my carriage door and one of them said in an American accent, ‘someone’s sitting in our seat’. Now I understood why the others had been looking at me strangely, I’d been sitting in their reserved seat. The man’s words took a while to sink in as I realised he was speaking English and I could understand him. He was very cute so I said ‘there’s more than enough room for you here, I’ll move over’ and patted the seat next to me. All the way to Budapest we chatted. It was the usual travel stuff, where have you been, what have you been doing, where are you from. The cute one, Eric, was from Iowa and had been in the Peace Corp in the Gambia in Africa for the past two years. His English mate Dave with a very dodgy looking moustache had also been in the Peace Corp. I had nowhere organised to stay in Budapest and no friends there so after a while I suggested that perhaps we could find accommodation together, trying my hardest not to be too obvious that I was finding Eric very cute indeed. They thought it was a good idea as they had no accommodation organised either, and when we arrived in Budapest’s train station a woman with some bed and breakfast accommodation approached us and convinced us to go with her. She was only a short way from the train station she said. It wasn’t that short, 20 minutes or so my car and longer by bus. We had a room all together with three beds. That night we hung out in a local bar and Eric mentioned that it was his birthday the next day. As I didn’t have any definite plans for sightseeing so I said I’d love to celebrate his birthday with him. Their idea of spending a day in Budapest was to do a pub/bar crawl. We managed to do that while incorporating sight-seeing and meeting locals. After all, what better way to meet locals than in a drinking establishment, or ten? The day started at around midday and we spent it travelling from bar to bar, including catching the Funicular railway and spending some time at the top of it before descending and going to another bar. Towards the late afternoon Eric and Dave told me that they’d arranged to meet up with two fellas they’d met in Prague and meet them we did. The first thing they told us was that they’d been to a great place the prior evening called The Pink Pussycat and they were really keen to go again. Without too much prompting they told us it was a lap dancing place. Obviously it wasn’t the type of place I would normally frequent but I was going to see the day out – after all it was Eric’s birthday. The Pink Pussycat was one of those establishments where you don’t pay upon entry, but pay when you leave – you pay for everything when you leave, including the lap dances. After we sat down and I had a chance to look around I realised I was the only woman there who wasn’t an employee. All the seats faced towards the dance floor and all the girls wore were g-strings and when they weren’t doing lap dances put on various dancing shows. All I can say is I’m glad I was drunk because being in an establishment like that sober would have been too much. At some stage during the evening Eric and I held hands and through the drunken haze there was a definite connection there. After we left the Pink Pussycat we’d missed our last bus so stayed at the other guys place as they were more sensible and had a central location. As they were also staying in a room in someone’s flat we left via the bedroom window so the owners wouldn’t see us. I had one more night in Budapest after this and I had a chance with Eric to take things further and I never did because I knew it would only be for that one time and I didn’t think I could bear it. We parted ways and I had a day in Budapest by myself before boarding a train to head back towards London as I’d run out of money and needed to get some more work. Eric and Dave were heading off to Poland. I was sitting on the train waiting for it to leave the station when I looked out the window and saw Eric walking up and down the platform. I’d told him where and when my train was leaving from. I leaned out the window and chatted to him for a couple of minutes before the train departed and we held hands again just as the train started. I’ll never forget my time in Budapest. I’m sure it would have been quite different if I hadn’t accidentally sat in reserved seats en-route to Budapest. I’ll never forget Eric either. After I got back to London I wrote to him in the States but I never heard back from him and I sometimes wonder if he remembers his time in Budapest?